Nothing is ever free is it? No – but some things come pretty damn close. 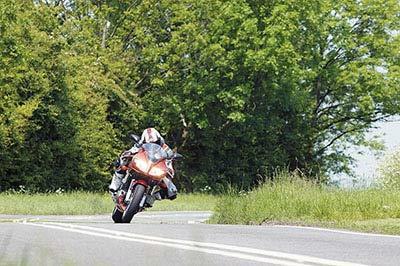 After laying out for the price of a bike and all the associated riding gear, anything which helps boost the bike’s and the rider’s performance with the investment of a few minutes’ time, or a few quid, has to be worth it. Are we talking a lot more performance? Not necessarily. But what gains are netted, like one horsepower here and one there, can add up to a big difference. But don’t forget, performance is not just about horsepower. A good chassis set-up can make a considerable difference to the way a bike performs – and not just in a straight line but with every aspect of riding. 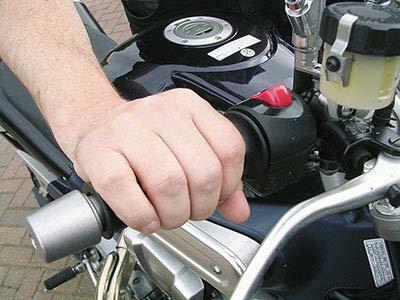 And the same rule applies to riding ability – anything which makes a rider comfortable, warm and generally at ease will naturally make you safer and faster. Is this an experts-only job? If you can shake a can of chain lube you can apply it. Similarly if you know which is the business end of a screwdriver then turning it is just as simple. What you have to remember is that if a change is made to the suspension (for example) then it is just as easy to revert to the original setting. The bare minimum of tools you possess should include: a 1/2in drive socket set (8-19mm), a selection of Pozidrive and flat-bladed screwdrivers, combination spanners (8-19mm), and the usual stock of lubricants such as chain lube and WD40. If you have the spare cash MCN highly recommends buying the correct size socket or spanner to fit the rear wheel spindle nut – the spanner which comes with your bike’s standard toolkit is a budget tool which will eventually bend and distort. 1. 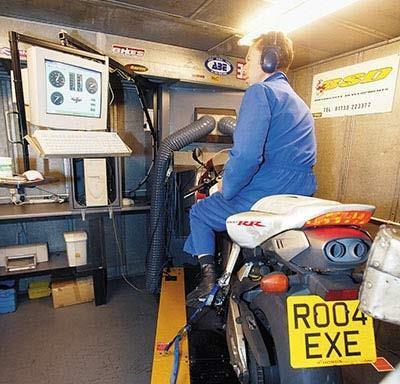 Lubricating the bike’s drive chain can flow another 2bhp to the rear tyre – proven on bikes tested on a rolling road dyno. Any lube (spray on or pour type) should be applied to the lower chain run on the inside of the rollers as the wheel is turned. 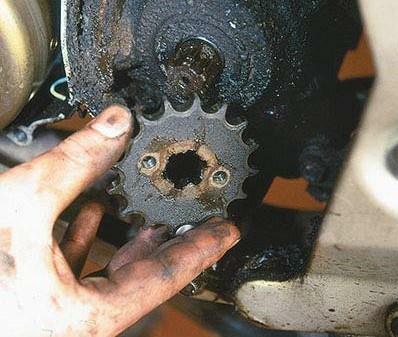 This ensures the lube is then ‘flung’ through the chain’s roller pins for good coverage. 2. 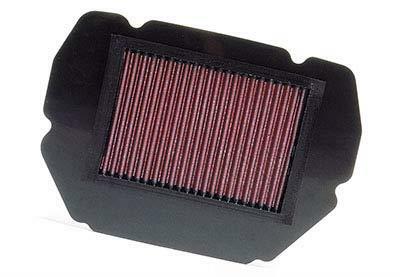 Cleaning the air filter regularly will stop it getting clogged with insects and grit particles, which reduce air flow. Paper element filters should be tapped and blown clean with an airline. Foam or fibre element filters need cleaning with solvent and re-oiling with filter oil (both available from your dealer). 3. A stretched throttle cable won’t net you instant acceleration, or at worst won’t fully open the throttle butterflies for top end performance. The cable should be adjusted so, with zero play, resistance can be felt from the throttle butterflies opening. When done turn the bars lock to lock to ensure the cable isn’t too tight – the revs will rise if it is. 4. There’s only a very small clearance gap between brake disc and caliper pads. 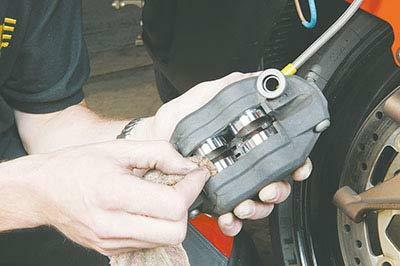 On dirty or corroded calipers that gap virtually becomes non-existent because the pistons and pads can’t move away after braking. This causes friction, and when the pads and discs expand with heat they produce even more friction. Clean those calipers! 5. 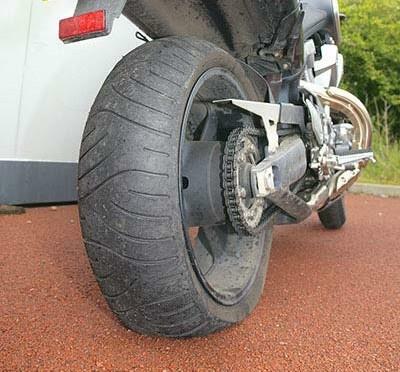 Tyres can slow you down if their pressures are incorrect. Too low and the tyre will deform, ruining your machine’s handling as well as overheating, which can cause damage to the internal carcass. Too firm and the tyre will skip off bumps rather than absorb them and wear at a faster rate. 6. 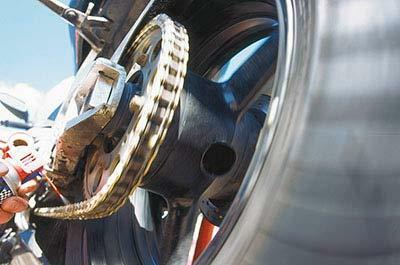 Changing the bike’s front sprocket (£7-13) to a smaller size – normally one tooth less – alters the final drive ratio to increase the bike’s acceleration at the expense of outright top speed. The only drawback is speedos driven by the front sprocket will over-read by a few mph. 7. 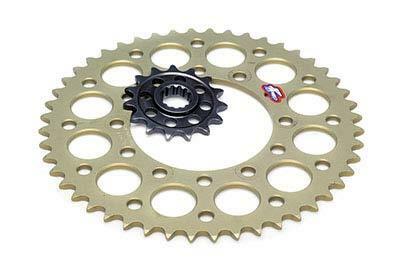 If absolute top speed is what you’re after then the reverse of 6 (left) is for you – a larger front sprocket or smaller rear sprocket (£18-35). This is only recommended if the bike revs out on standard gearing. Another effect of this is reduced fuel consumption, as the engine isn’t working so hard (lower engine revs) at any given speed. 9. 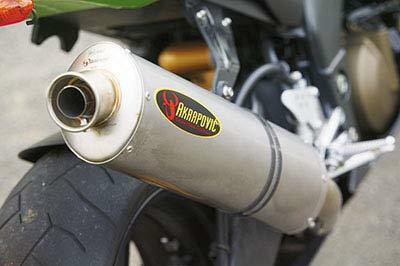 …Which can be either a simple adjustment of the bike’s carburettor(s) (change the main jets or lift the needles) or by fitting a tuneable carb corrector kit (Dynojet kit for CBR600F, £105). 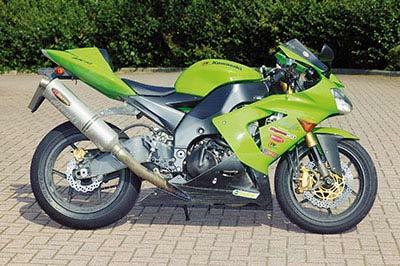 Fuel-injected bikes are non tuneable as such so an adjustable Dynojet Power Commander kit (eg 2004 Yamaha R1, £270) is the only alternative. 11. 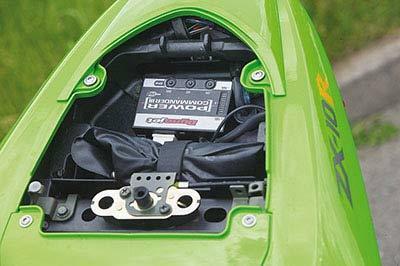 Reducing the power to weight ratio of a bike can mean quicker acceleration and improved handling. Basically this means getting rid of anything that isn’t necessary. Pillion pegs are the first things to go, then the mainstand. 12. When all is said and done, the only way to get more from the bike is to first look at the rider. Riding well is an art and it starts with the rider being relaxed so responses and reactions are up to speed. Keep warm if it’s cold. Drink plenty if it’s hot. Above all else, every time you ride, do it with the intention of having fun.